The technique of affixing very thin sheets of metal, called leaf, to a surface. For the backgrounds of religious panel paintings as well as for frames, gold leaf was most often used, but artists and framemakers have also employed silver, tin, aluminum, and other metals. The oldest and most common method is water gilding, in which the surface is prepared with a coating of bole, a mixture of red clay and water-based binder. Once set, the bole is wetted, reactivating the binder, and the leaf adhered to it as soon as it is places in proximity. When the whole surface is covered, the leaf can be burnished to a brilliant metallic finish with polished mineral or bone. Mordant gilding, the other principle method, is achieved by applying an adhesive (mordant) to any surface. When it is dry enough to be sufficiently tacky, the leaf is laid on. This method differs from water gilding principally in that it cannot be burnished. Mordant gilding was primarily used in painting to add linear decoration in metal to the painted surface, usually to imitate gold cloth or metallic embroidery on drapery. The adhesive should be applied selectively to the painted surface in any pattern desired and the leaf would stick only to those areas. Powdered gold mixed with a binder was later used to apply linear decoration. It is called shell gold because of the shell used as containers and in which it was mixed. 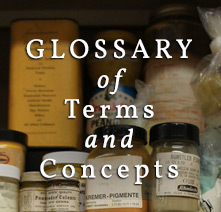 Source: Looking at Paintings: A Guide to Technical Terms / eds. Tiarna Doherty and Anne T Woollett. (Los Angeles: J. Paul Getty Museum, 2009), pp. 36-37.